It results in a removal of planned recordings, however, it does not cause the removal of already recorded programmes. With the use of horizontal and vertical arrows, select Settings/Ustawienia and click OK. In the Settings menu, select Restore factory settings/Przywróć ustawienia fabryczne and click OK.
You will be asked to enter the Customer’s PIN code. Unless you have changed it, enter 0000 and confirm with OK button. Confirm another message again with OK button. Following this action, the set-top box will restore factory settings and will restart (it may take about 1-2 minutes) by launching an activation process, which is carried out in accordance with the below described stages. 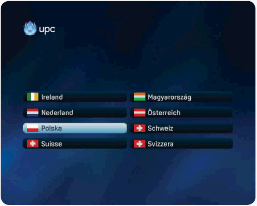 Having switched on the set-top box, the country selection window will be displayed (the word INIT or UPC will be seen on the set-top box display). Select Poland/Polska with arrows on the remote control and confirm the selection with OK button. Enter the UPC activation code relevant for your location. You will find it in the below search engine. If you have chosen a wrong location, click back to return to the previous window and enter a correct code. Following the entry of a correct code, click OK. The signal strength is not 100% in the majority of cases. The set-top box will automatically search for channels. Click OK to confirm. From now on, you can use the UPC Digital Television. If the above instructions have not solved your problem, call us at 813 813 813. We can check the operation of your set-top box only if it is connected to the power supply in the place of the service provision. Thus, please do not bring the Mediabox set-top box to any UPC Store.